At Pure Water Solutions, we install Residential and Whole House Reverse Osmosis Systems for Grants Pass and surrounding Southern Oregon communities. All Pure Water Residential and Whole House Reverse Osmosis Systems are GUARANTEED to PURIFY ANY BAD WELL and are GUARANTEED TO PERFORM AS REPRESENTED OR YOUR MONEY BACK. We offer a broad range of Reverse Osmosis water purifying systems suitable for both commercial and residential applications. Choices includes compact units like the LG under the counter system, which produces 50 gallons per day (GPD) of purified water. 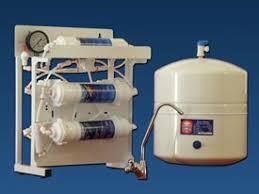 And, large units like the state-of-the-art Whole House Reverse Osmosis system, capable of purifying 2,000 to 14,000 GPD. The highly-skilled staff at Pure Water Solutions have many years of experience and training. As a licensed Oregon contractor, we are able to offer complete system installs for our Grants Pass clients. We are local and family owned – not a franchise. We work with a network of experienced Oregon licensed sub-contractors and contractors across Southern Oregon to make your Reverse Osmosis system install project quick and worry-free.